Design shown is a two piece unit. The top is tongue & groove designed sealed with a fibrous mastic sealant. Steel reinforced with 10m rebar. Tanks conform to National Standards of Canada CAN/CSA B66-10. 75 mm. PVC Pipe cast in top of lid for access of any electrical cords. 3 100mm inlets and a 100mm outlet. Cast in place 610mm ID. 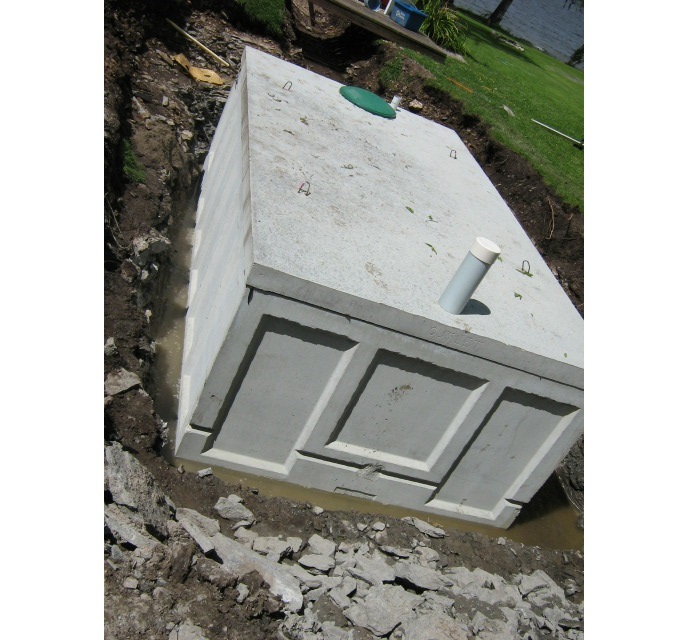 plastic risers with plastic lid secured with stainless steel fasteners extending 100mm above top of tank. Designed for up to one metre burial over top of tank - vehicular traffic and up to two metre burial tanks are available upon request.